The Economics Honours class of '69 returned to the University's Parkville campus on Friday 1 April for a reunion lunch at University House. Based throughout Australia and overseas, many of the group have remained close since graduating but this was the first time they came together on campus in Melbourne since receiving their testamurs all those years ago. But, alumnus Doug Walter explains that the impetus behind organising the lunch was somewhat bittersweet. Following the sad passing of fellow honours graduate, Geoff Burfurd, Doug and his classmates decided not to let the years go by without meeting as many of their class as possible. "I volunteered to organise a reunion and to make it sooner rather than later," says Doug. Nine of the original class of '69 attended the reunion with three travelling interstate. “Of the 18 still alive, we could not find four, and five are overseas,” explains Doug. 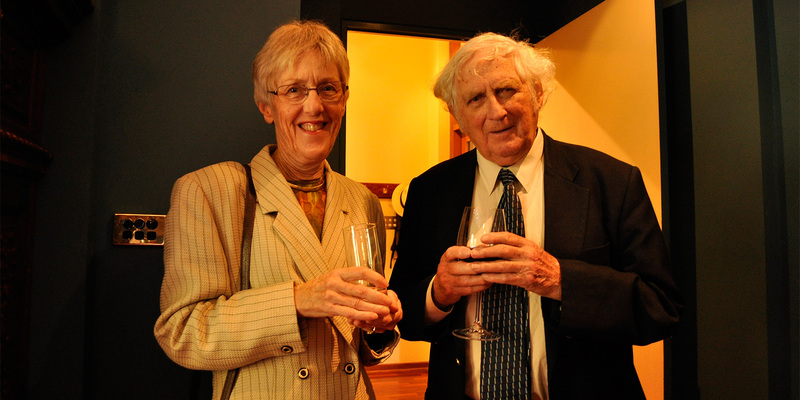 Professor Alan Gunther, an influential Economics lecturer at the time and Emeritus Professor Geoffrey Blainey, a prominent Australian historian, academic, philanthropist and commentator who assisted many of the group with their honours theses, attended the event. The group also welcomed Geoff Burfurd's wife, Noela. The lunch prompted many of the guests to share stories and reflect on their time at the University. They shared tales of academics ducking as paper planes zoomed around the lecture theatre, and memories of the delightful jibes when one classmate won the title ‘Mr University’. Some guests even spoke of how they met their future spouses in the Baillieu Library. Alumnus, Dr John Leaper jumped at the chance to catch up with fellow graduates. "The members of the Honours group developed a special bond during the 3 years we were together, says John. 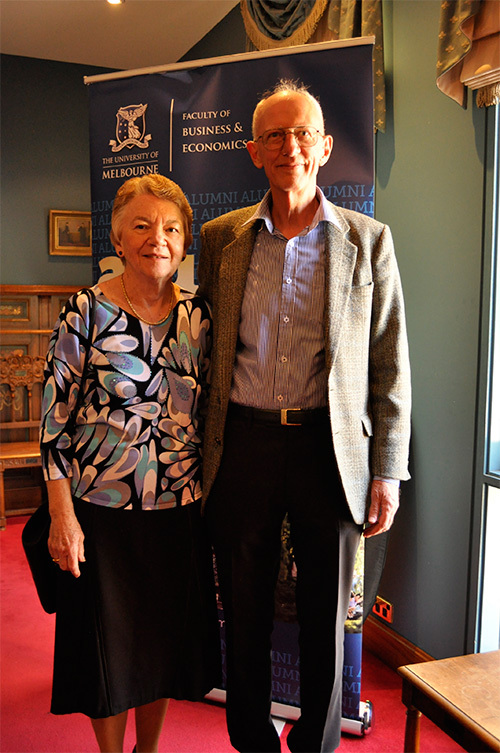 We rarely meet now, so I was very keen to take part.” John and his wife Jenny, who met at the University of Melbourne and encouraged all three of their daughters to study at Melbourne as well, clearly have a strong affinity with the University. They continue to be actively involved in the current student experience by sponsoring a number of scholarships and staying up to date with Faculty and University initiatives. “We think anybody who us lucky enough to attend The University of Melbourne has a great opportunity to contribute to a better world." The Faculty’s Alumni Relations team assisted Doug with preparations for the reunion, helping to find missing alumni, contact academic representatives and also to attend on the day to provide an update on the Faculty’s news and the current student experience. If you wish to arrange your own reunion and would like information on how to do this, please contact the Business and Economics Alumni Relations team on fbe-alumni@unimelb.edu.au or Ph: +61 3 8344 5381.